We’ve been an American Girl family since 2011, when Faith saved up her birthday money to buy Julie. In 2012 Grace asked for Kit for Christmas, and we’ve been visiting our local American Girl Seattle store ever since. During our spring break we had a fun staycation getaway weekend with a special American Girl hotel stay package and a visit to our AG store. Our day was delightful so now I’m sharing the photos I took of our fun at the American Girl Seattle store. We were attending an American Girl special event, Grace’s Sweet Spring Break, so we had to arrive early and were given a gift bag when entering. There were plenty of staff and the whole check in and entering process went very smoothly. When we checked in we were given a schedule that showed our rotation times based on what color bracelet we were given in line. I was really impressed with how well thought out and organized the whole event was. We never felt rushed or crowded, yet they had around 100 people attending the event! 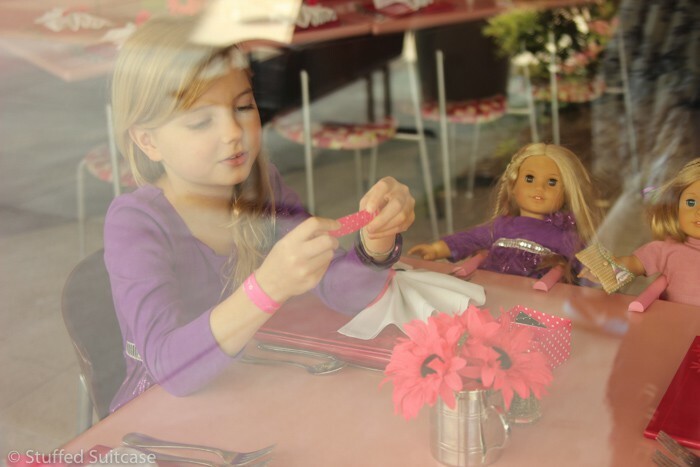 The Grace’s Sweet Spring Break event was focused around the new American Girl Doll of the Year, Grace Thomas. She loves to bake and takes a trip to Paris where she’s inspired to start her own business! We arrived early and you can see they were prepared with a rope line up for families to stand in. Before the 9 am start time, a couple of employees came out to check us all in from their list and give us our color bracelet bands. Our first stop was the treat boxes station. Here we were able to decorate some take out boxes that would later be used to house our yummy sweet treats! You can see Grace Thomas, the girl of the year, looking on in the background. Our next stop was the scavenger hunt. We each received an itty bitty doll size passport and were sent around the store to find the signs with information about Grace’s time in Paris. It was a great little travel tour meets scavenger hunt blend! Getting ready to decorate some macaroons at Grace’s Spring Break event. Finally we reached our last stop, the Bistro. Here the girls were outfitted with chef pastry hats and we were stationed at a plate of cookies. Kit got a pastry hat too! Inside our gift bags were doll sized pastry hats, the girls really loved that! After making our macaroons and cupcakes, we headed to the Doll Hair Salon. We made appointments for both Kit and Julie to get a spa service and braid. Our final stop for our fabulous day at the American Girl Seattle store was to have lunch in the bistro. Enjoy the photos below of our special family time! Julie and Kit joined us for lunch – plus a special menu dedicated to Grace Thomas, the girl of the year! My caesar salad was scrumptious! Dessert served as a little flower pot! Our family made some fabulous memories, and our trip to the American Girl store was a favorite for my girls. Do you have an American Girl fan? I highly recommend planning to visit your nearest store and creating some memories of your own! 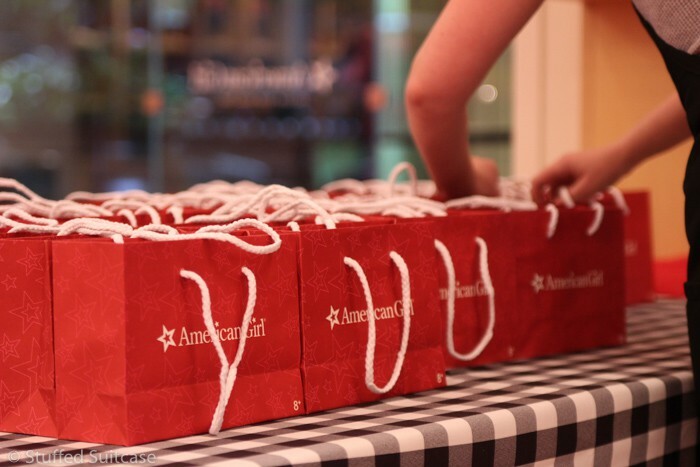 I’d love to know, what would be your favorite part of an American Girl store visit? Thank you to the American Girl store for hosting our family for your spring break event and lunch. All thoughts and opinions are my own and unbiased.